This Hunt is for a $2500 Stunning Trophy Blackbuck Antelope. We also have Management Blackbucks at $700 and Trophy Blackbucks at $1500. 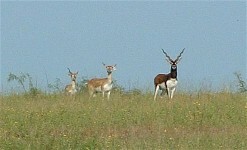 The Blackbuck is considered to be the most exotic of all the exotics. Mature males are black and white in color with some brown on the back of the neck and also on the spine close to the tail. The young males and females are light tan and white. The horns, found only on males, corkscrew up and back. A large male will weigh 100 pounds while a female will weigh 75 pounds. Males mark their territory by going to the bathroom in the same spot every day. They run very fast. While on this hunt you can also take other animals at addtional fees such as: Aoudad, Axis, Corsican, Fallow, Ibex, Mouflon, Sika, Texas Dall, Black Hawaiian, New Zealand Mountain Goat, Merino, Painted Desert, Four Horn, Catalina, Whitetail, Hogs, Turkeys, and much, much, more! Bring the entire family and have the experience of a lifetime. We have hunts to fit every budget, from Meat Hunts to Trophy Hunts. The sizes of Trophy Blackbucks will vary. There will be Trophy Blackbucks larger and smaller than pictured.